Why we visited the Walla Walla wine region. Wine Enthusiast included Walla Walla in its "best wine travel destinations" and described it as a growing up-and-coming wine region. We study women winemakers and this information caught our attention. Through our research we have learned that newer and growing wine areas can offer greater opportunity for qualified women wanting to break into the traditionally male-dominated field of winemaking. We wondered if this would be the case in Walla Walla. The growth in the number of Walla Walla wineries is significant. The Walla Walla Valley's first winery, Leonetti Cellar, was established in 1977, followed by Woodward Canyon (1981), L'Ecole (1983), Waterbrook (1984), and Seven Hills (1988). By 2000, there were still fewer than 20 wineries in the region. Today there are an estimated 150 wineries in the Walla Walla AVA, with more appearing on the horizon. Needless to say, the rate of increase is quite dramatic! The growth and reputation of Walla Walla as a wine region are likely related to the unique and highly regarded Enology and Viticulture Program established at Walla Walla Community College in 2001.2 College Cellars of Walla Walla, a modern and fully equipped teaching winery bonded in 2003, is located within the Center for Enology and Viticulture and is a key component of the educational program. According to our calculations, only 9% of wineries in the Walla Walla AVA have a lead women winemaker.3 As a point of comparison, the corresponding overall percentage for California is approximately 10%, but in areas in which the number of wineries is growing, such as Santa Barbara and Sonoma Counties, it is closer to 15 to 20%. To learn more about the women winemakers and their experiences, we arranged meetings with five highly impressive winemakers. They are Marie-Eve Gilla of Forgeron Cellars, Mary Derby of DaMa Wines, Holly Turner of Three Rivers Winery, Ashley Trout of March Cellars-Vital Wines, and Tanya Woodley of SuLei Cellars. We briefly describe the career path of each woman and later in our article share the steps they are taking to challenge the status quo. 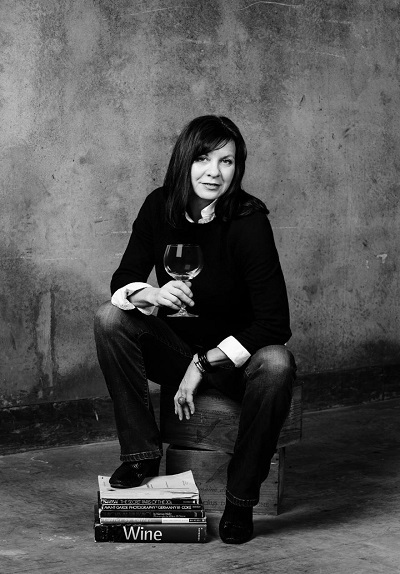 Marie-Eve Gilla is the Founding Winemaker and Managing Partner at Forgeron Cellars. French-born Marie-Eve is the first woman winemaker and winery owner in the Walla Walla AVA. She founded Forgeron Cellars in 2001. It was only the 23rd bonded winery in the AVA and is a smaller-production winery of high-quality wines (Nina Buty founded Buty Winery in 2000 but is not its winemaker). The winery is located in what previously was the site of a blacksmith shop, which accounts for the name Marie-Eve chose for her project. In French, the word "Forgeron" refers to artisans who build with their hands, combining experience with an extensive knowledge of their trade. She earned her Diplome National d'Oenologie (Masters) at the University of Dijon, gaining practical experience and training in Burgundy's wineries and vineyards before coming to the U.S. in 1991. In 2013, Marie-Eve was inducted into the Seattle Chapter of the prestigious Les Dames d'Escoffier International. Her wines have received many accolades and are consistently highly rated by the Wine Advocate, The Washington Wine Report, and The International Wine Review, among others. We had the pleasure of tasting a number of these award-winning wines in Forgeron's lively and attractive tasting room. These included her excellent 2013 Forgeron Barbera, 2014 Forgeron Chardonnay, the 2013 Façon Rouge, and our favorite, the creamy and intense 2013 ANVIL Cabernet Sauvignon Dionysus. 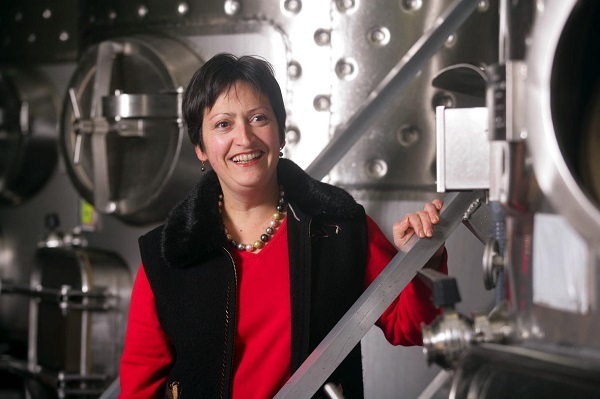 Mary Tuuri Derby is the Winemaker and Owner of DaMa Wines. A number of life experiences led Mary, a classically trained opera singer from Minnesota, to found DaMa Wines in 2007. Mary describes herself as "an artist, idealist, and dreamer-a magician who feels she can pull something positive out of nothing." She also excels at collaboration. Kathryn Elsesser partnered with Mary to produce the 2017 Walla Walla Women of Wine calendar, which features black and white portraits of notable women in the Walla Walla wine industry. The wines of Mary's winery have received many awards and accolades, including those from the Wine Spectator, the Wine Enthusiast, and The San Francisco Chronicle Wine Competition. We continued our engaging conversation with Mary in DaMa's lovely tasting room, where we admired her wines' artistic labels and tasted several of her delectable award-winning wines. These included the 2012 DaMa Merlot, 2012 DaMa Cabernet Sauvignon, 2013 DaMa Grenache, and the 2012 DAMAnation GSM, a gorgeous blend of Grenache, Mouvedre, and Syrah. We especially loved her Cabernet Sauvignon and Grenache. Ashley Trout, Winemaker and Owner, March Cellars-Vital Wines, has made wine throughout various parts of the world for the past 18 years. As a freshman at Whitman College in Walla Walla, she took a part-time job at Reininger Winery and continued to work at wineries throughout her years as an undergraduate student. In 2006, three years after her graduation, she launched the highly successful Flying Trout Wines and was its founding winemaker. She sold the label to TERO Estates in 2010 and continued as winemaker there until 2015. In 2016 she launched March Cellars. That same year she also started Vital Wines, a nonprofit label whose sales are intended to help fund better access to healthcare for seasonal vineyard and winery workers in Walla Walla. Ashley was invited to pour her highly acclaimed wines from both brands at the 2017 pre-Oscar party in Los Angeles, the first time a Walla Walla winery has been invited for an Academy Award event. There, Trout poured "The Gifted," a red blend under the Vital brand, and the 2014 Chardonnay from March Cellars. We purchased the very last bottle of "The Gifted" and it was delectable! The 2015 vintage of Vital, "The Given," a blend of Cabernet Sauvignon, Malbec, Cinsault, and Tinta Cao, is now available. The day we visited the tasting room we were delighted to taste Ashley's March 2014 Chardonnay, March 2015 Malbec, and March 2016 Rosé in addition to her 2015 Vital red blend. All were excellent. Holly Turner, Winemaker at Three Rivers Winery, has been in the wine industry for 18 years. She earned her bachelor's degree in biology from Western Oregon State College and began working in food science and quality assurance. Her love of wine led her to a position at Chateau Ste. Michelle, courses at UC Davis, and a stint at Bodega la Rural winery in Mendoza, Argentina. In 2002, she was appointed as the winemaker at Three Rivers Winery, which was founded in 1999 and became part of the Foley Family portfolio in 2008. Under Holly's direction, the wines of Three Rivers Winery have earned dozens of scores above 90 points from the nation's top writers and publications. The spacious Tasting Room for Three Rivers Winery is located at the winery and is set atop a small knoll overlooking the surrounding vineyards and Mill Creek. Varietals being poured the day we visited included the 2013 Three Rivers Malbec, 2013 Three Rivers Cabernet Sauvignon, and the 2015 Three Rivers Reserve Chardonnay, Columbia Valley. We especially enjoyed Holly's 2016 Three Rivers Estate Rosé, Walla Walla Valley, with its clean fruit flavors and bright acidity. Tanya Woodley, the winemaker and owner of SuLei Cellars, moved to Walla Walla 12 years ago to complete the Enology and Viticulture Program at Walla Walla Community College. A former marketing representative and buyer in the music industry, she had spent time with people who loved wine and found herself building a wine cellar and wanting to try her hand at winemaking. She worked as an enologist at various wineries in Walla Walla and as a winemaker at Whitman Cellars before launching SuLei Cellars in 2007, the 60th bonded winery in Walla Walla. A Wine Press Northwest "Washington Winery to Watch", SuLei wines have received awards and accolades from Seattle Wine Awards and the Cascadia Wine Competition, among many others. The day we visited, Tanya shared several of her wines and the story behind her two labels-SuLei, a name derived from Sulis Minerva, a Celtic Mother Goddess, and Roller Girl, a name reflecting love for the sport of roller derby. We were especially taken with her 2015 award-winning SuLei Roussanne and 2014 SuLei Cabernet Sauvignon. Her second label 2013 Roller Girl Wine Jammer Red was very approachable and reasonably priced! Women winemakers we were not able to meet during our brief visit include Anna Schafer, winemaker and partner at Maurice Cellars, Deborah Hanson, winemaker and owner at Cougar Crest Winery, Amy Alveraz, winemaker at Abeja, Lori Kennedy, winemaker at Don Carlo Vineyard, Julia Russell, winemaker and owner at Mansion Creek Cellars, and Ali Mayfield, winemaker at The Walls. The women with whom we spoke were well aware of their low numbers and are taking steps to change this situation. A significant first step was the production of the handsome "Celebrating the Walla Walla Women of Wine 2017 Calendar," a collaboration between the photographer, Kathryn Elsesser, Mary Derby of Dama Wines, and other women of wine in Walla Walla. A key goal of the project was to bring more visibility and legitimacy to women winery owners and women winemakers and their extensive contributions to the wine industry. The increasing number of wineries and a growing wine industry brings new opportunities that can challenge long-standing barriers. As one winemaker noted, "we need to get over it" and use our talents, passion, and skills to take our rightful seats at the table in what has been a male-dominated industry. The importance of being more visible is illustrated in the December 2015 article, "Walla Walla Winemakers Support One Another. "4 The article makes no mention of a woman as a winemaker, winery owner, or mentor. Indeed, its title should have been, "Walla Walla Male Winemakers Support One Another." Any women winemakers who may have worked with or mentored these men-and there were some-remained invisible. This is the kind of unconscious exclusionary thinking that the Calendar and the women in the industry seek to change. 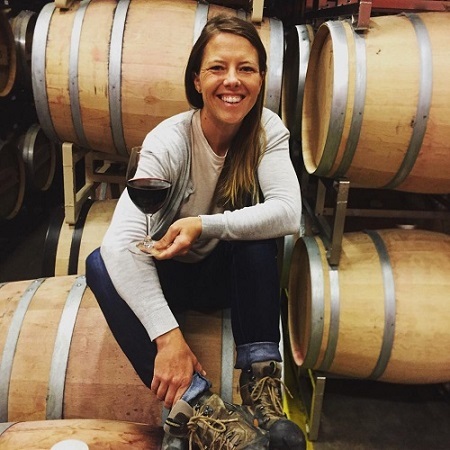 These notable women are working to increase the visibility of Walla Walla's current women winemakers, to mentor and support women entering the field, and to encourage more women to study enology and viticulture. In addition they are taking the lead in collaborating with others to develop an inclusive community and bring greater recognition to the Walla Walla wine area. We heard again and again that people in the area are very kind and readily share equipment and expertise. Both Mary Derby and Ashley Trout directly experienced this kindness in setting up their wineries and now are leading current efforts at collaboration with Walla Walla wineries and producers. When Mary's spouse Devin died in an accident in 2004, nine Walla Walla wineries got together and donated a large quantity wine, the sale of which ultimately funded the establishment of DaMa Wines. Ashley, the driving force behind Vital Wines, works closely with top vineyards to obtain donations of grapes to support her non-profit project. Other companies and individuals donate needed materials and labor. The Walla Walla women we talked with are following their own collective advice. They are bold, persistent, and committed. They are clearly articulating why they make the wines they do and how their talents contribute to the greater good. They drive forklifts, they collaborate with women and men in the cellars and the vineyards, and they craft superb wines. Nonetheless, having 15 to 20% of the wineries in the Walla Walla AVA with lead women winemakers will be a formidable task to achieve, but it is a goal they (and we) think is well within reach. 1Author Bios: Lucia Albino Gilbert, PhD, and John C. (Jack) Gilbert, PhD, both professors, have had long and distinguished careers at The University of Texas at Austin and Santa Clara University and are widely published in their fields. Their research on facilitating women's career success in male-dominated scientific fields such as winemaking combines Lucia's academic field of Psychology and John's academic field of Organic Chemistry. They can be reached at lgilbert@scu.edu. Their research website is www.womenwinemakers.com. 2 "The Walla Walla Community College Center for Enology and Viticulture: Building a competitive advantage of place." Nicholas Velluzzi, Doctoral Candidate, Department of Geography, University of Washington and Walla Walla Community College Wine Cluster Economic Development, 2007.